After 34 years of nursing at Paynesville Area Health Care System, Delores Schmitt left behind a legacy of caring and commitment when she retired in July. Deeply appreciative of the quality and depth of Delores' work ethic, Bev Mueller, acute care administrator for PAHCS, said, "She brought what we call tender loving care to her patients, and she served as a role model on what a nurse should be and is." The large number of people present for her retirement party in the hospital dining room gave evidence to the respect and friendships she had garnered throughout her tenure. Smiling at the memory, Delores was genuinely surprised at the turnout of old friends, family, co-workers, and residents. Embracing her July retirement after 34 years of nursing for PAHCS, Delores Schmitt now spends her time volunteering at the Paynesville Area Center, gardening, travelling, and visiting with friends and family. She grew up in a close-knit family, the youngest of five sisters, on a farm near Watkins. Becoming a nurse caught her interest after her older sister, Rosemary, became an LPN for a university hospital in Michigan. Enrolling in 1954 at the College of St. Catherine's nursing program in St. Paul, Delores worked at St. Joseph's Hospital as part of her training. Though the classes were generally rigorous, the curriculum had some elements, like learning how to crochet and knit, that are no longer required of nurses. Graduating from the three-year program in 1957, she married Joseph Schmitt a year later. She devoted the next ten years to raising a family of six boys and three girls on the family's farm. Allowing for family time was paramount for Delores. Initially she only returned to nursing on a limited basis. Eventually she was able to arrange a full-time schedule, working the 2 p.m. to 10 p.m. shift. Delores said, "I always made sure I had the dinner ready for them before I went to work, I'd get the kids off to school, and Joe would take care of them in the evenings." The time away on weekends and holidays was the hardest part of her nursing career, she recalled. When she began at Paynesville Hospital, as it was called years ago, there was just one emergency room and one ICU. Nurses were skilled in all units of the hospital because of its smaller size. PAHCS has evolved a great deal since that time, Delores said. Throughout 13 years at the hospital and 21 years at the Koronis Manor, Delores said the things she first loved about nursing haven't changed. "It's the people you care for and the people you work with that are the most important," she explained. One of the reasons Delores started at Koronis Manor was that she wanted to try caring for older people. She always made a point to stop and say hello to all the residents during her shifts, taking special care to visit the ones who were self-sufficient and didn't get as much daily interaction as the ones who were more dependent. Now with her days free, Delores still enjoys weekly visits with one of her ex-patients who became a close friend over the years. Her decision to retire came about for a number of reasons: the Schmitts had company coming from Germany in August, a trip planned to Scandinavia in September, and Delores, who was turning 65, thought it was finally time to enjoy her weekends. Embracing the pleasures of retirement, Delores said, "You can do the things you've always wanted to, stop and smell the flowers and pull all the weeds. You can do things at a slower pace, although I haven't seen it yet." 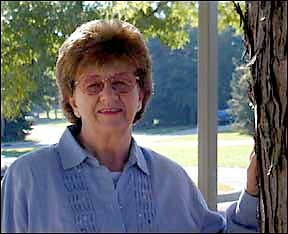 Her days are now filled volunteering at the Paynesville Area Center, quilting with her church group, spending time with family, and travelling when possible to watch her husband play in skat tournaments around the world. Joseph, now retired after farming for many years, seemed a bit reticent when she first mentioned the thought of wrapping up her lifelong nursing career. Delores said, "When I told him I was ready to retire he said he had grown used to being his own boss all these years," pausing to smile, "But I think it's working out just fine."